One of my best best friends, Cameron, has a super cute blog that recently caused me to fall head over heels for this Loeffler Randall bag (only 1 left on Shopbop!). So, I thought I'd use it as a center piece amongst some of the fabulous pink, orange and red color block pieces I've been drooling over lately! Pair ANY of these 3 colors together and you're bound to look bright & fabulous while making a statement. 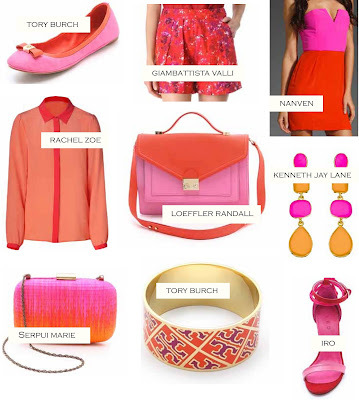 As you know, I'm really into bright colors, so these items are ALL on my wish list. What are your favorite bright colors to pair? Those Tory Burch shoes are too cute! I also really like that Nanven dress. It would be perfect for a beach wedding. Aren't they just the cutest?! And you're right - the dress would be ADORABLE for a beach wedding. Absolutely gorgeous. I can't decide what I like most! I am obsessed with these color combination! The clutch is very pretty. So great together, right? I am in love with the clutch also (: Thanks so much for stopping by! great selections!! love the color combination! the Lanvin dress is amazing! Aw thank you! I really appreciate you stopping by! Awesome and wonderful collection of women accessories. How nice are the accessories are! Everyone should prefer from your wish list. You have a wonderful color combination collection of fall shoes, mini skirt,hand-bag summer dress. I would like to share an information about fashion. Just click on below.